The final basic production model of the M4 series medium tanks to come from the Detroit Tank Arsenal used a new composite hull with a cast glacis with the complete “big hatch” section for the driver and the bow gunner and initially the low bustle turret without and later with a loader’s hatch. Nearly all of the US tanks were sent to serve with the US Army in the Pacific, but a number were also supplied to the British. 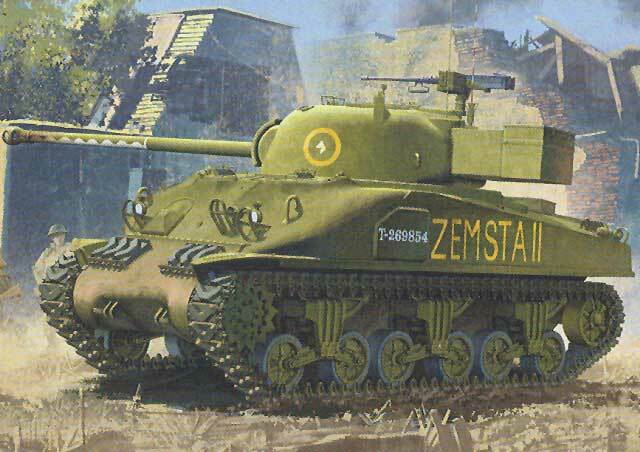 Most if not all of those provided appear to have been converted to take the 17-pounder antitank gun, and hence the designation of Sherman Mark IC Firefly. A number of years ago DML released an Imperial series kit of the “Composite” hull M4 which could be built as either a US Army M4 in the Pacific or a Sherman IC Firefly; the kit included two turrets but suffered from the original Italeri suspension clone and also the much-disliked three-piece DML VVSS tracks. As with the M4 Composite PTO kit (No. 6441) this kit is a total do-over and shares nothing but its subject with the original kit, but does use most of the “common” sprues from recent DML M4 Smart Kit releases. The kit provides brand-new moldings of the low-bustle turret with British-added loader’s hatch, radio compartment and stowage bin, two different armor blanking plates for the bow gunner’s machine gun, and British mounts for spare track links on the transmission housing. There is also a stowage bin for the rear of the hull (engine deck), a British antenna mount with guard, and other niceties. A check of the sprues show some more tweaks as well. The standard suspension sprue now comes with 12 bolt heads molded on the runner and other additional bits (apparently different spare links) have been added. Three different finishing options are provided in the kit and Cartograf decals for each one: one British vehicle - A Squadron, Coldstream Guards, Germany 1945 (either 2A or 2C); 3rd Squadron, Polish 6th Armored Regiment “Dzieci Lwowskich”, Italy 1945 (“Zadlo”); and 3rd Squadron, Polish 1st Krechowiwecki Lancers, Italy, 1945 (“Zemsta II”). Optional marking for each one are included. Overall this replaces another older DML kit (which will now find its way to the sale tables or eBay) with “Smart Kit” level details and seems to be a really nice job of it.